WordPress is an amazing Content Management System (CMS) and is the program that I use for probably 95% of all the new sites that I create, both for myself and for my clients. The best part is that no two sites ever need to look or act the same due to the thousands of themes available to change the appearance, and the many thousands of plugins available to add further functionality to the core program. Here I am going to go over a number of plugins that I use on a regular basis. Now I just know that you’ve heard the saying ‘The money is in the list’, and if you haven’t heard it before you’ve heard it now! And it’s true. EVERY single business on this planet earns money from their list, whether that be a previous customer list, a networking contact list, a newsletter list, or any other list that you can think of. It is far easier to make sales to someone that you have had previous contact with then it is to make sales to people who have never heard of you before. So you need a list, and in an online business that normally means a list of people who have either signed up for your newsletter, downloaded something for free from one of your sites, or has made a purchase from you. Your list will normally contain simply a name and an email address, though some lists will have far more information that you can use to target your prospective clients. To make managing a list easier we all use auto-responders. 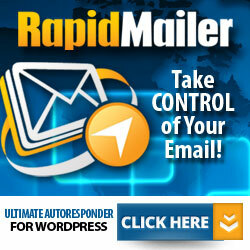 Simply put an auto-responder is a piece of software that can collect, store, filter and manage your list of names. It also allows you to mail to these names whenever you want to either by setting up a series of follow up messages, or by sending a broadcast message or newsletter when you decide to. You have possibly heard of the big names in auto-responder software, such as Aweber (the most popular amongst marketers), but you probably haven’t heard of IMSC Rapid Mailer as it is not a company but a WordPress plugin. IMSC Rapid Mailer works like a conventional auto-responder but has one major advantage… It’s on your domain hosting so you have control over it! This also means that you don’t have any monthly fees to pay. It also has many features that aren’t available on many of the commercial companies offerings. I am using IMSC Rapid Mailer on a few of my niche sites and already have found that it is easy to use, makes great looking broadcast emails, and appears to have a good delivery and conversion rate. Check out IMSC Rapid Mailer here…. you will also see that I have added a whole raft of bonuses to the package worth over $400! On many of my sites, my own and client sites, there is a need to display a number of images in a number of ways. This could be anything from a single image as a page focus to a complete and complex gallery of images. Now it’s not really that difficult to create a simple gallery with the built in editor in WordPress, but they aren’t pretty! So I use NextGEN gallery whenever I need something a bit, OK a lot, prettier. You can start with the free version, the download link is at the bottom of this page, but very soon you will like to use some of the features that you get with either of the paid version. NextGEN Plus gives you much more control over the way that your images are displayed with many more gallery options, social commenting, mobile friendly with swipe support, and much more. This is a really neat plugin that is so easy to use. NextGEN Pro gives you everything that Plus gives you but with the added benefit of full eCommerce and Proofing. I use this one successfully on a couple of photography sites that I run. So next time you need to display some images give NextGEN a try, I guarantee you’ll like it. Fresh Store Builder – OK this isn’t strictly a plugin, though there is a matching plugin available to link your store and a WordPress blog, but it is an amazing piece of software that creates the best looking Amazon affiliate store that I have ever seen. Much of my online income is made through Amazon stores on a large number of sites that I own. Many use store builders, but generally the store builders are pretty inflexible. You set up certain parameters, activate the script, your site gets populated with Amazon products. The problem is that you get very little control over the number or quality of the products being inserted into your store. And frequently there is very little control over the layout of the store. But my new favourite store builder is a cracking piece of software. It’s called Fresh Store Builder and it is the best piece of software that I have found yet. It’s not new, as it is now in version 6, but the latest version takes store building to a whole new level. Here is a store that I built yesterday – Grilling and Chillin’. This took me about four hours to build from start to finish, and that included the software install and product population. It’s not perfect or finished but it looks ten times better than any other of my store builder sites. The one thing that I will say in the interests of being totally transparent with you… This is a complex piece of software so there will be a steep learning curve if you are not already familiar with this type of product. It is possible for anyone to build their own store if you follow the detailed video and written instructions available but it may take you a bit of time and a lot of cursing to get it right. You will need your own domain name and hosting (good hosting here) to install this software, and the ability to create a MySQL database on that hosting, all pretty common stuff these days. This may be a bit daunting but I have a very special offer for anyone who wants a site like this, and I mean VERY special! Go to this page – Let Me Build Your Next Site, place your order, then let me know in the comments section at PayPal that you want a ‘Fresh Store’ built. I will get back to you to confirm a few details then get your store up and running in your chosen niche. You will then be handed the reins of your own ‘ready to run’ Amazon store and have full access to make whatever changes you need to in the future. With my connections at Fresh Store Builder I am able to offer this as a special service to you. If you would prefer to purchase your own copy of Fresh Store Builder then I can still help you with install and configuration. I charge a very reasonable $50 for this service, contact me for details. Internal Links Lite – This is one of a number of products that I use on many of my WordPress sites. It gives the easy ability to create an internal linking system that really does help in a sites ranking within the search engines. I can offer you this version as a completely free download.